Women Explorers – Perils, Pistols & Petticoats tells stories of pioneering women explorers before 1900. A great read for girls aged 10+ (£7.35 Amazon). 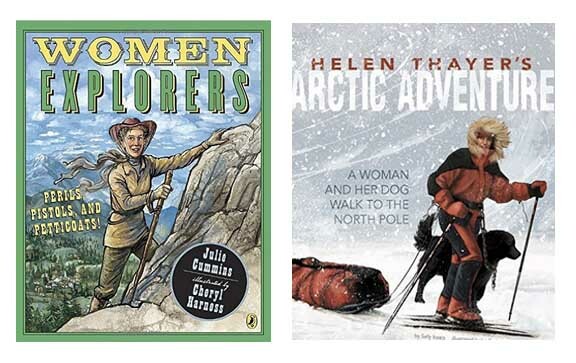 Helen Thayer’s Artic Adventure tells the real life story to 7-10 year olds of Helen Thayer, the first woman to travel solo to the magnetic North Pole pulling her sled with no outside help (Amazon £6.79). We all want our girls to be confident, daring and bold. Don’t we? Boys have Anthony Horowitz’s Alex Rider to fan the flames of literature whilst Bear Grylls is revered as Chief Scout by thousands of boys across the UK. Brownies lack no real figurehead with which to electrify & inspire and gutsy heroines seem rather thin on the ground since Nancy Drew. After attending the Shextreme film festival in Bristol a couple of weeks ago, it struck me again how vital it is to have female explorers and adventurers as role models for young girls. If you’re looking for stocking fillers, here’s my top 6 picture books of real life pioneering women to encourage your girls to break boundaries. Raising two girls, 8 and 5, I am constantly battling the effects of gender influencing. One of my most important tasks, I believe, as a Mother, is to keep my daughters’ peripheral vision open when it comes to what they can achieve in life. Whilst I encourage, cajol and insist ‘you can’, it’s an uphill struggle against a world saturated with gender sterotypes. From tiny pop ads to teacher gender (at our local school the Head is the only male) young children absorb society’s messaging from a tender age. The search for non-gender specific Christmas presents, the hunt for picture book biographies of female pioneers, the pursuit of courageous girl protagonists (that aren’t princesses) in novels – it’s not easy. My go to website for inspiration is the marvellous A Mighty Girl. It’s a US site so heavy on Americans, but still a wonderful site to find biographical picture books that can be read to those as young as three. Most of the books featured on A Mighty Girl can then be picked up easily on good old Amazon. Shextreme, only in it’s second year, is a film festival dedicated to celebrating female explorers. Born from the frustrating portrayal of the lack of women in extreme sports, ShExtreme’s aim is to get women and girls out there to take the leap, to taste adventure, to push their limits. If more women adopt this, and, with more events like ShExtreme & portrayal in the media, girl adventurism will trickle down to our daughters. This years festival featured panel speakers Adventurer Squash Falconer, Olympic snowboarder Jenny Jones and outdoors adventure journalist Sian Lewis of The Girl Outdoors blog. A sell out event, the audience were captivated with film clips of resolute women pushing the boundaries in extreme environments. I loved it! More please! We need it! I want my girls to have the same opportunities as boys. I don’t want them to switch off to subjects like maths & science. Girls need strong women role models. We need all children, regardless of gender to be exposed to it so it drips down into society in the hope that one day it will be as normal to have a girl adventurer, explorer, scientist, astronaut, mathematician as a boy. What’s your opinion? What do you do to counteract gender sterotypes? Do you have any other fabulous books to inspire young girls? I really enjoyed this blog and it gave me some great ideas for books to get my daughter when she’s a little older. Ellen MacArthur was always a female adventure icon for me. She has several incredible books to inspire kids when they are a bit older than they are now. Thanks so much Katy. Yes! Ellen MacArthur – such an inspiration! I haven’t read any of her books so will definitely look those up. Thanks for the recommendation.